It seems to me that we used to go caroling fairly frequently when I was a kid. Or we would have people caroling to us. Maybe people are just too busy to do that so much anymore. Or perhaps it's just the nature of our society now, that you just don't go around singing to strangers. Or opening your door to strange people singing. Our doorbell rang last night and we opened it to this. Which was totally unexpected. And they weren't all strangers. That goof on the left actually spends quite a bit of time here. They sang a couple of songs for us, and they were quite good singers. It was a nice touch to the season. The last time I went caroling was our first year in Duluth. We were invited by one of my husband's co-workers to a caroling party. There was a lot of food, and the hostess was quite proud of the fact that they had their traditional lutefisk. Which we were required to "at least taste it." Which I did. Nuff said. 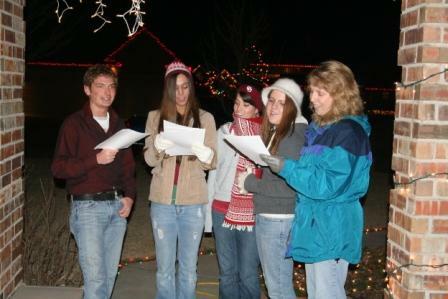 Then we went caroling. There was 40 plus inches of snow on the ground from the Halloween blizzard plus some other snowfalls after that. We had just moved from Corpus Christi, Texas, so our blood was thin. I don't remember what the temperature was. Suffice it to say that it's difficult to sing when your mouth is frozen. We were invited the following year, but we declined. You know, because of the lutefisk. Yuck. Lutefisk. I'm sorry I wasn't around last night for the caroling festivities. I would have loved to have seen Trevin singing. Oh for fun---having carolers singing at your door!!!! And about the lutefisk---it's just fish!!! We had it every Christmas Eve when I was growing up, and I've never been able to understand why everyone seems to hate it. Must be the Norse in me!!!! jess - Yeah, it was nice. Trevin wasn't singing too loudly. Maybe he thought the cat would hear him and run under the bed. lois - It was fun, they were very good! The lutefisk just had a very odd texture. And they do something to it with lye??? Merry Christmas and hugs to you and yours! Merry Christmas Linda to you AND your wonderful family! Hopefully one of these days we'll all get together in person instead of crossing paths so often. Oh and btw, they only soak the lutefisk in lye, you know, to get it to be all slimy before you cook it to death. I don't know what your problem with it is. Sheesh. h-man - Hope you all have a wonderful Christmas. As for getting together, isn't Blogesota still on? Maybe I'll bring lutefisk. Hey, I figure if Garrison Keillor can make fun of it, it's fair game! Whether you are creating a diagram from scratch or modifying an existing one, Visio 2010 Download helps you add and align shapes easily and accurately, with features such as the Quick Shapes Mini Toolbar, enhanced dynamic grid, page Auto Size, and automatic alignment and layout adjustment. Microsoft Project Standard 2010 Download offers flexibility and choice by providing tailored work-management solutions for individuals, teams, and enterprises. Visio 2010 Download helps business and creative professionals communicate and collaborate more effectively and securely with virtually anyone, anywhere. Unify a wide range of content in a single organized PDF Portfolio. Collaborate through electronic document reviews. Create and manage dynamic forms. And help protect sensitive information.